The National Institute of Health (NIH) reports that a new study published December 10, 2018, in the European Heart Journal shows there is now another reason to avoid large consumption of red meat as it raises the risk for heart disease. While it has been well documented that red meat has unsaturated fat, which can lead to heart disease, new research shows that a chemical generated in the gut called trimethylamine N-oxide (TMAO) also has been linked to heart disease and is raised to very high levels in people who eat a lot of red meat. In fact, the TMAO levels are three times higher than the amount found in people who eat white meat (fish and poultry) or get their proteins from a mainly plant-based diet. The good news, however, is that TMAO levels can be very quickly lowered by not eating red meat for a month. Doctors will be able to test people for the amount of TMAO in their blood to see if they are at risk of heart disease from consuming too much red meat. Doctors believe that about a quarter of middle-aged Americans anyways have elevated TMAO levels apart from getting them from meat. Screening to find these individuals would give doctors the chance to warn people that they are at high risk for coronary heart disease because of elevated TMAO levels and that if they eat a lot of red meat their TMAO levels will rise even higher. Each participant had to eat for an entire month one of the three diets and then eat for a month another one and finally eat for a month the third diet. The red meat diet contained about eight ounces of steak to be eaten every day or two beef patties weighing a quarter of a pound. Those who ate the red meat based beef diet plan had three times the amount of TMAO in their blood compared to when they ate the plant-based or white meat diets. In fact, during the month when they ate the white meat or plant-based diet, there was a significant drop in the levels of TMAO which gave evidence that changing one’s diet could lead to a dramatic change in the levels of TMAO. Stanley L. Hazen, the lead author of the study and the section head of Preventive Cardiology and Rehabilitation at the Cleveland Clinic said that the study suggests that lowering the TMAO levels lowers the risk for coronary heart disease. According to the Centers for Disease Control and Prevention (CDC), heart disease is the leading cause of death in the United States and kills about 610,000 people each year, which is one in every four deaths. Coronary Heart Disease (CHD) is the most common form of heart disease and CHD kills over 370,000 people every year. According to the American Heart Association (AHA), about 16.5 million Americans age 20 and over have coronary heart disease (CHD). This year 720,000 Americans will experience their first hospitalized heart attack or death and another 335,000 will have a recurrent event. According to researchers, many heart attacks and strokes could be prevented by following a heart healthy lifestyle that includes eating heart healthy foods, getting plenty of physical exercise, not smoking, not drinking alcoholic beverages in excess and managing blood pressure and chronic diseases like diabetes. It is believed that if people changed their lifestyle habits, many heart attacks could be prevented. It appears that according to this study and previous ones, that if people decide to eat less red meat they can lower their risk for developing heart disease. Eating meat on a daily basis, which most Americans take for granted, was not the norm for life 100 or more years ago. People might have had a bit of meat or poultry only one day a week or less. Today an American can start the day with sausage and eggs for breakfast, which might not be such a bad idea if they then went out to do a hard day’s physical work like on a farm or ranch. However, a large majority will head to an office and spend hours sitting in front of a computer. They may also eat meat like a hamburger for lunch and for dinner they may have a steak. The researchers suggest that people add more fresh fruits and vegetables to their diet and eat less red meat. If you or your loved one are recovering from a cardiovascular event like a heart attack or stroke and need cardiac rehabilitation and care, the Royal Suites Healthcare and Rehabilitation in scenic Galloway Township, New Jersey would be a good choice. Royal Suites is surrounded by eight acres of beautiful woods and landscaped gardens and another recent study shows that living near greenery can help to prevent heart disease. See our blog post from December 6, 2018. 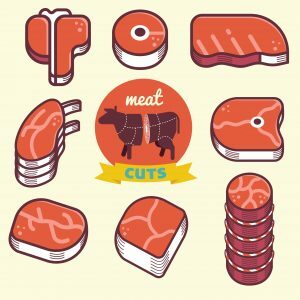 It certainly pays to make lifestyle changes in order to lower the risk for a stroke or heart attack and this study shows that one good way would be to cut down on the amount of red meat that is eaten.